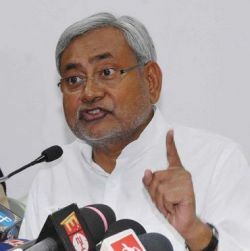 Bihar's ruling Janata Dal-United on Saturday night suspended 3 women MLAs including a former minister, for campaigning and seeking votes for Bharatiya Janata Party and Rashtriya Janata Dal candidates. JD-U General Secretary K C Tayagi said the party has suspended Renu Kumari Kushwaha, Poonam Yadav and Sujata Devi for anti-party activities and openly campaigning against its party candidates. “Enough is enough, the party has decided to suspend them after they failed to follow the party's directive and campaigning against its national president Sharad Yadav,” Tayagi said. Kushwaha, who resigned from the state cabinet of Chief Minister Nitish Kumar last month, is still a JD-U MLA from Bihariganj assembly constituency. However, she is openly campaigning and seeking votes for her husband Vijay Kumar Kushwaha, whom the BJP has fielded from Madhepura constituency. JD-U candidate and sitting MP Sharad Yadav is seeking re-election from Madhepura. Kushwaha has also been attending meetings of the BJP and its allies, including the Lok Janshakti Party and the Rashtriya Lok Samta Party in connection with the campaigning for her husband against Yadav. According to JD-U leaders, Nitish Kumar tried to persuade her to stay when she resigned, but she told him that as her husband had joined the BJP, it was not right for her to continue as a minister in Nitish's cabinet. Another MLA, Poonam, wife of Bihar strongman Ranvir Yadav, is campaigning and seeking vote for her younger sister Krishna Yadav, who is the Rashtriya Janata Dal candidate from Khagaria. Krishna is the second wife of Ranvir, a "bahubali". Ranvir said Poonam has been campaigning for Krishna. "For her, family is first," he said. Sujata Devi too is campaigning for BJP candidates against in Sitamarhi and other Lok Sabha seats.